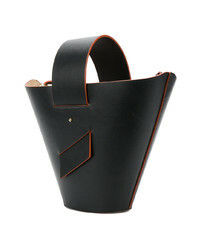 A black blazer and a Carolina Santo Domingo bucket shoulder bag is a good pairing to add to your casual lineup. To add oomph to your getup, finish off with black fringe leather loafers. 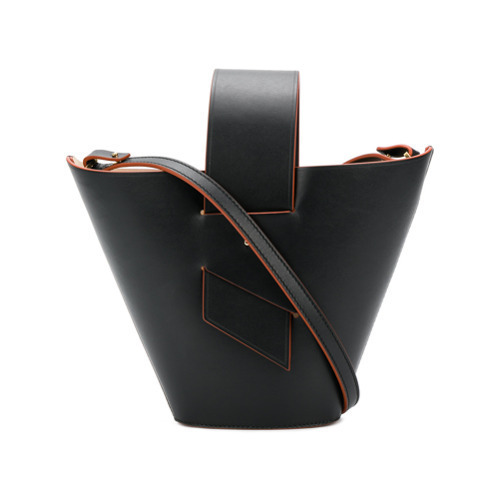 If you're all about relaxed dressing when it comes to fashion, you'll love this chic combo of a black turtleneck and a Carolina Santo Domingo bucket shoulder bag. Rocking a pair of gold leather pumps is a simple way to add some flair to your look. If you're a fan of relaxed dressing when it comes to your personal style, you'll love this extra adorable pairing of a black floral midi dress and a black leather bucket bag. A pair of black cutout leather ankle boots will add more polish to your overall look. If you're obsessed with relaxed dressing when it comes to your personal style, you'll love this totally stylish combination of a grey knit oversized sweater and a Carolina Santo Domingo bucket shoulder bag. Up the cool of your ensemble by wearing black leather ballerina shoes. We all want comfort when it comes to dressing up, and this combination of a black tank and a black leather bucket bag is a perfect example of that. 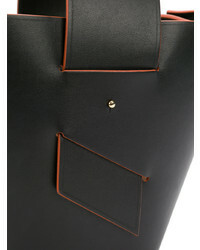 We're all seeking comfort when it comes to dressing up, and this combination of an olive military jacket and a Carolina Santo Domingo bucket shoulder bag from farfetch.com is a perfect example of that. Play down the casualness of your getup with black leather knee high gladiator sandals. If you're a fan of relaxed dressing when it comes to your personal style, you'll love this stylish pairing of a white dress shirt and a Carolina Santo Domingo bucket shoulder bag from farfetch.com. Play down the casualness of your look with black suede pumps. If you're a fan of relaxed dressing when it comes to fashion, you'll love this totally stylish combination of a white coat and a black leather bucket bag. 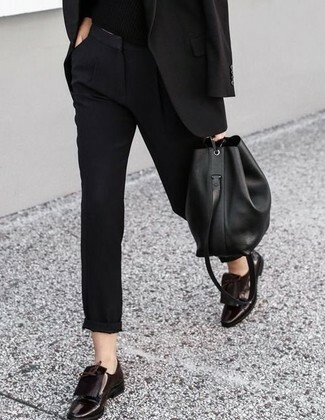 Up the cool of your ensemble by finishing off with black leather pumps. 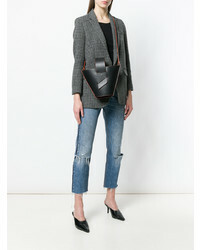 If you’re a jeans-and-a-tee kind of gal, you'll like the simple combo of a black double breasted blazer and a Carolina Santo Domingo bucket shoulder bag from farfetch.com. Lift up your outfit with white leather pumps.